Western media covered the tragedy of the flight's crash extensively, but coverage has waned as time has passed. The one-year anniversary of the flight's crash brought on a renewed interest in the tragedy. 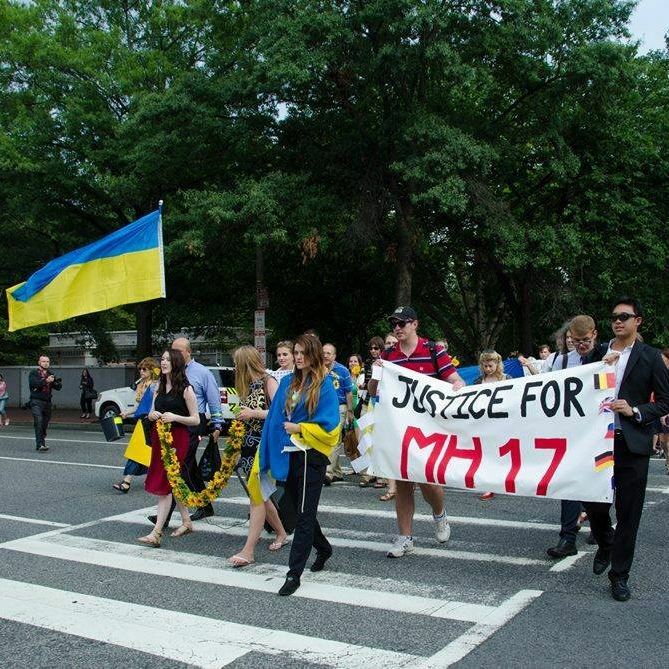 The U.S.-Ukraine Foundation and United Help Ukraine held a memorial march on Friday, July 17, 2015 in Washington, DC, to mark the one-year anniversary of Malaysian Airline Flight MH17's crash in Ukraine . 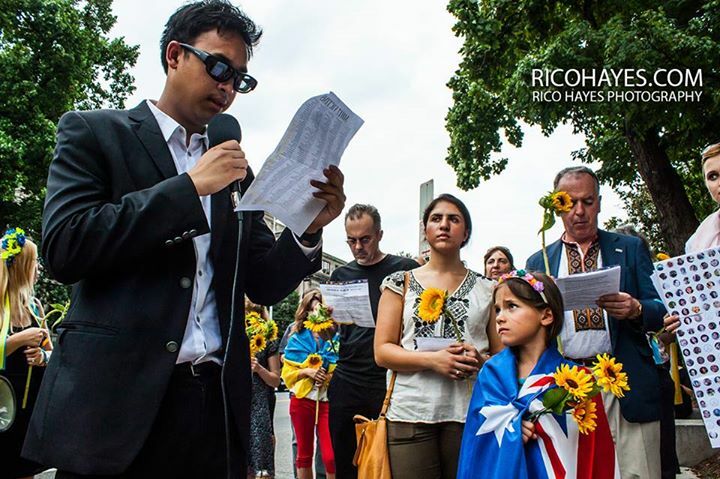 The march culminated with participants gathering in front of the home of the Russian Ambassador, reading the names of the 298 victims of MH 17's fatal crash, and delivering a written appeal to the Russian authorities to facilitate and not obstruct a full, transparent, and comprehensive investigation into the circumstances surrounding the downing of MH17. 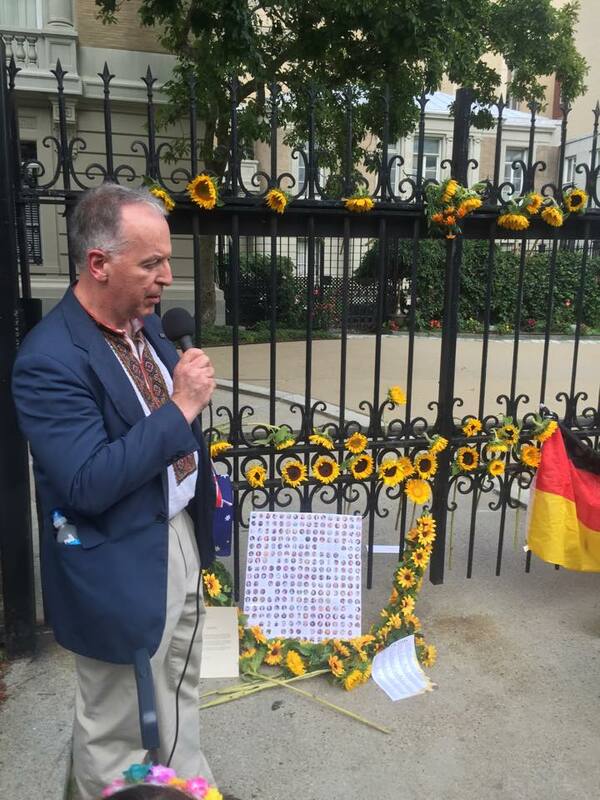 Along with the appeal, participants left sunflowers, a poster with the flight victims' pictures, and flags from victims' countries at the ambassador's residence. Police, after receiving complaints from inside the residence, asked participants to remove the items from the residence's gate and later even from the sidewalk outside of the gate. The march began at Lafayette Square, where participants gathered before proceeding to the official residence of the Russian Ambassador at 1125 16th Street, NW, Washington, DC. In Lafayette Square, the crowd of marchers grew gradually as people discussed the tragedy and prepared for the procession of a few blocks from the square to the residence. The crowd of participants was initially made up of the members of the U.S.-Ukraine Foundation but swelled to include about 70 people, mostly Ukrainians but also individuals of other Eastern European, German, and even Australian backgrounds. 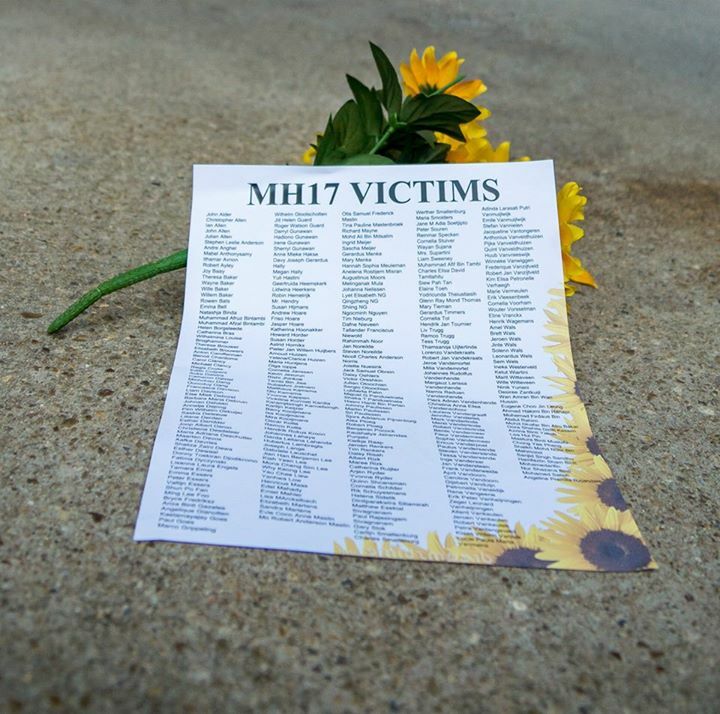 A sign reading "Justice for Victims of MH17" served as a center point for the crowd, which was peppered with Ukrainian flags, flags from the home countries of the flight's victims , and sunflowers. Even DC tourists who had come to see the White House were intrigued by the growing crowd and asked questions. Juliana Hale and her daughter, who were visiting from New Hampshire,were among those who stopped to learn more about the memorial's purpose. They had heard about the conflict in Ukraine and the crash of flight MH17, but were just learning that there had yet to be a conclusive investigation about what had happened to cause the plane to crash. The crowd was buzzing as participants discussed not only the fallout of the crash but also the current happenings in Ukraine. Members of the press, including Reporters from Voice of America, Russian Times, and 1+1, gathered alongside the marchers to film the event. 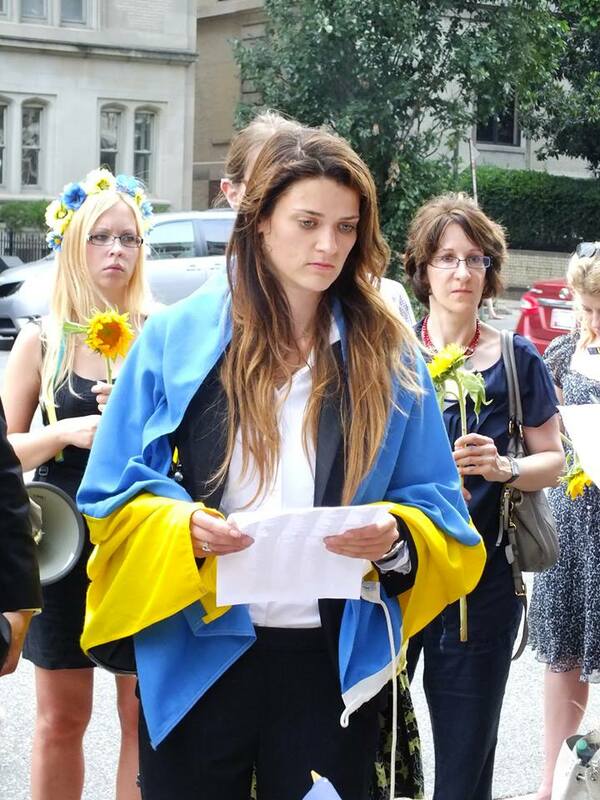 Olesia Dudar, a member of the Ukrainian activist organization Razom who was in Ukraine during the first days of Euromaidan said she heard about the Memorial on Facebook. "I love my country and that's my motivation for being here today," Dudar said. "People stopped talking about it [the crash]and I hope it [this memorial march] will remind them what happened." Kristina Boichuk of Washington, DC (and a former USUF intern) also heard about the memorial from Facebook. She hoped that the Memorial march would help inspire a push to find out the truth about what happened to MH17. "The truth needs to be recognized and there needs to be some kind of memorial for the victims," she said. Chad Nagle, who is of Polish heritage, subscribes to the U.S.-Ukraine Foundation's newsletter. He said that, after having spent time in Ukraine in the past, he regrets the war and dismemberment that is happening in the country and wanted to come to the memorial march to show solidarity with Ukraine. "When MH17 happened, I remember it distinctly and I knew then that it had been done by the rebels," he said. "It's good to bring attention to this issue and to say that we have not forgotten a year later. It's people's lives. People died from many different countries. It's a big tragedy and somebody should be held responsible for it," said Tetyana Zelenska, who is working with the Foundation on a project concerning Ukraine's labor market. 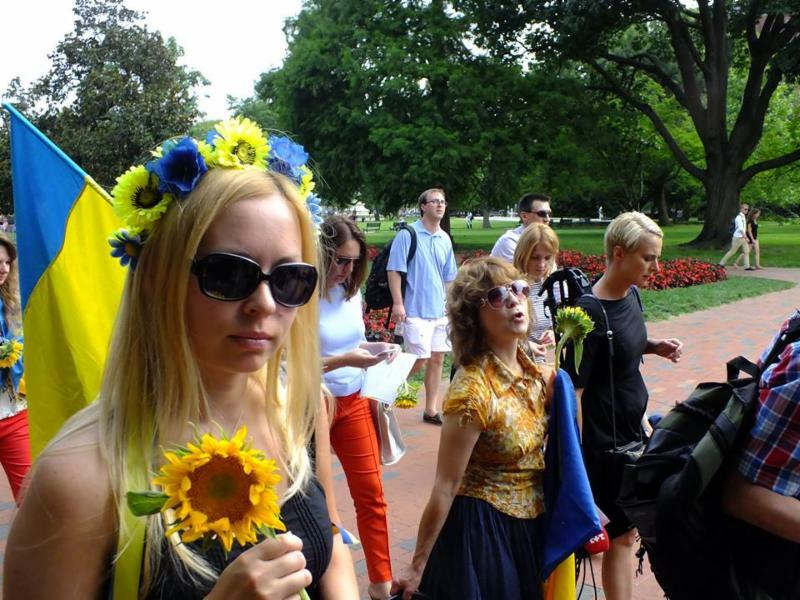 After John Kun of the U.S.-Ukraine Foundation thanked the crowd for coming and introduced the march, marchers holding the banner demanding "Justice for Victims of MH17," a garland of sunflowers, and a Ukrainian flag began to lead the rest of the crowd in a solemn procession to the Russian ambassador's residence. Music played in the background as marchers chanted "Remember MH17" and "Justice for the 298 Victims." 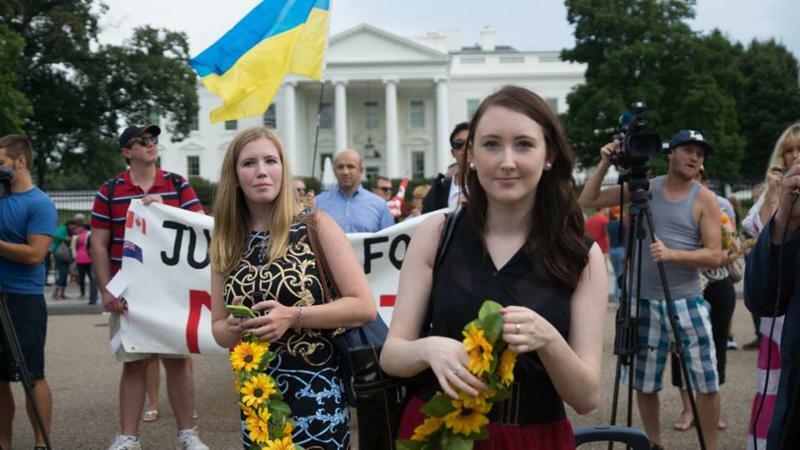 A letter from the U.S.-Ukraine Foundation asking participants to bring sunflowers to the march referenced another article that had been published earlier this week by Sydney Herald correspondent Paul McGeough and photographer Kate Geraghty. The correspon-dents distributed sunflower seeds from the MH17 crash site in war-torn eastern Ukraine to the families and friends of crash victims showing how tender shoots of sunflowers can represent "Proof of life." The letter also noted that a famous Dutch painter had painted a sunflower and given a painting to the each of the families of the victims. 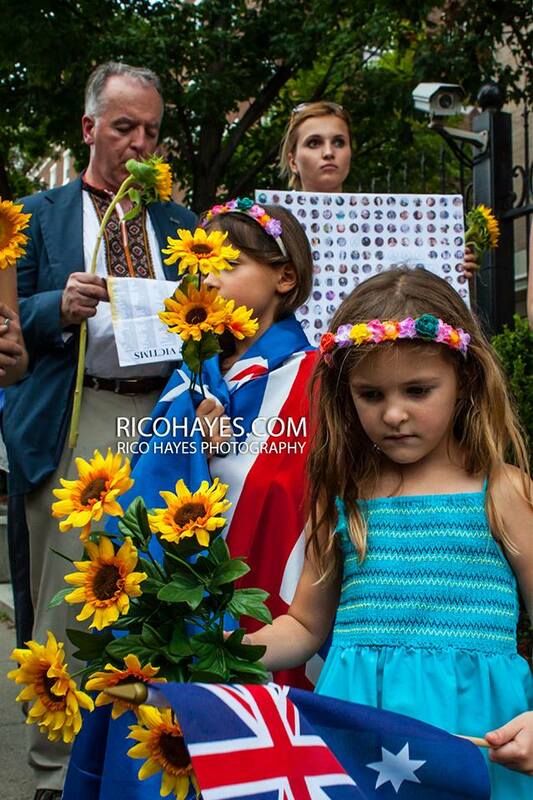 Indeed, in DC and abroad, the sunflower became a symbol of solidarity with the international community of mourners for the flight's victims as members of the international community took the time to honor the one-year anniversary of the tragic loss of life aboard Malaysian Airline Flight MH17. While most international audiences have identified the Russian or Russian-backed troops as being responsible for Malaysian Airline Flight MH17's devastating crash, Russian authorities continue to deny all accusations.